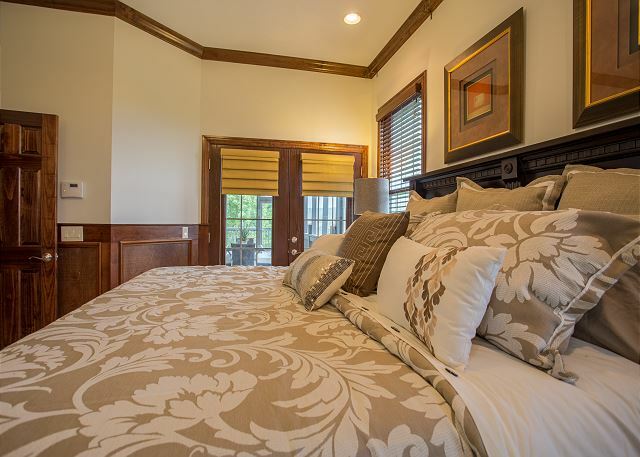 Beauty and class are the only accurate description of Buffalo Ridge Retreat. 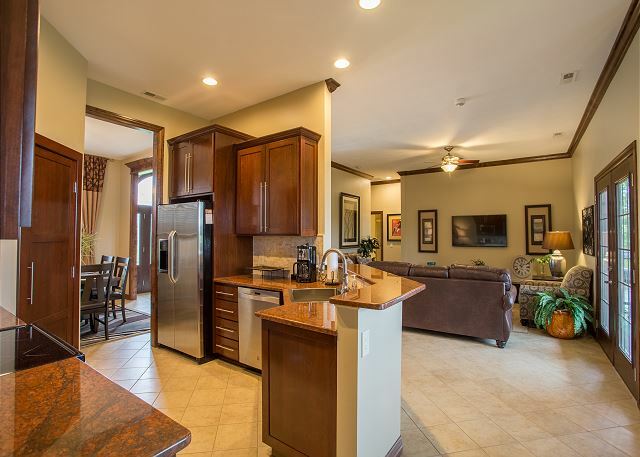 And with all that elegance comes all the comforts of home, including a full-sized kitchen for you to make any meal you fancy and all the space you and your loved ones could possibly need. Three separate bedrooms gives every member of your party their own breathing room, and that doesn't including the spectacular living spaces! The 4th bedroom has a queen sleeper sofa. Settle down and cozy up in the living area as you catch up on the news and your favorite shows on the flat screen television. Finish up your favorite novel in the sitting nook; the perfect place to relax and unwind after an exciting day in Branson! If reading outside is more your style, take a seat out in the screen in deck and watch the sky roll by over the picturesque horizon. The wondrous landscape of the Ozarks has more than beauty to offer: it has days worth of fun as well! Take a drive to Historic Downtown Branson and have a blast as you shop, dine, and play the day away. Take a stroll down to the Branson Landing and make sure to catch the awe-inspiring Fire-and-Water show right on Lake Taneycomo! There's so much to see and do in Branson, and you're guaranteed to go home with many memories that will last a life time. 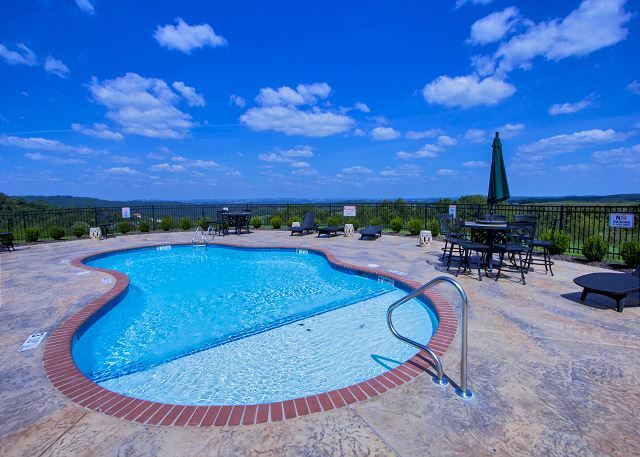 This is the third time to rent this property for a vacation and I would highly recommend it to anyone looking for a nice vacation in the Branson area. Thank you so much for this great review, Dean! We love hearing that you had such a great time, and we really hope to host you again very soon! Direct TV did not have any sports channels. Kitchen was lacking in mixing bowls. Otherwise it was a very nice place and very clean. I wouldn't advertise it as a 4 bedroom since one was a den with sleeper sofa. It would sleep 10 with the two sleeper sofas. Beautiful area and we were happy with the house. We are so happy to hear that you enjoyed your time staying with us, Bonita! Thank you for the review, and we hope you'll stay with us again on your next trip to the area. Very good experience. Plenty of room and a great accommodation. Very Clean and a Great home. 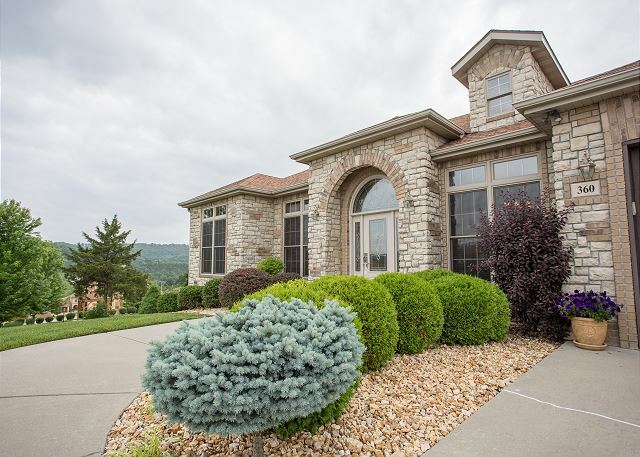 Great house just outside of Branson near great golf courses. This was a beautiful property with great views. We saw some awesome sunsets. It is close enough to town yet quiet during the nighttime. The pool at the clubhouse on top of the hill was awesome. We even saw buffalo one day! Just a note on some things we thought might help others that come here. Kitchen is very minimal in terms of cooking supplies. No grill tools, wine glasses, rubber spatula, baking pans, mixing bowls, cheese grater, kitchen towels, sponge or even salt and pepper so bring your own if you need those things. It says it can sleep 10 but 2 of the beds are pullout couches that are not very comfortable for adults so keep that in mind. We had to do laundry for the towels as there were not enough to get through the week (we did bring our own pool towels). (no big deal really). We seemed to be here during fly season so be prepared for that (locals said it seemed like they were excessive). Overall, a great stay and we made many great memories! Buffal Ridge retreat is everything we thought it would be and more. Our 2nd year renting this house. Great stay for a guys golf trip. 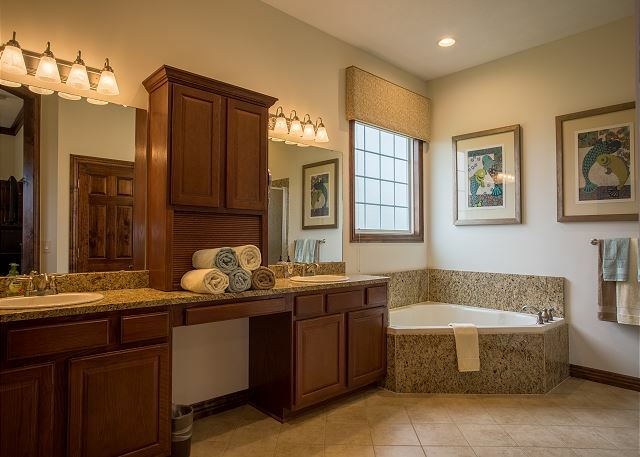 Very nice master suite and 2 bedrooms that share a bath. You can make a 4th bedroom out of the formal living room via a fold out couch and doors that slide closed. 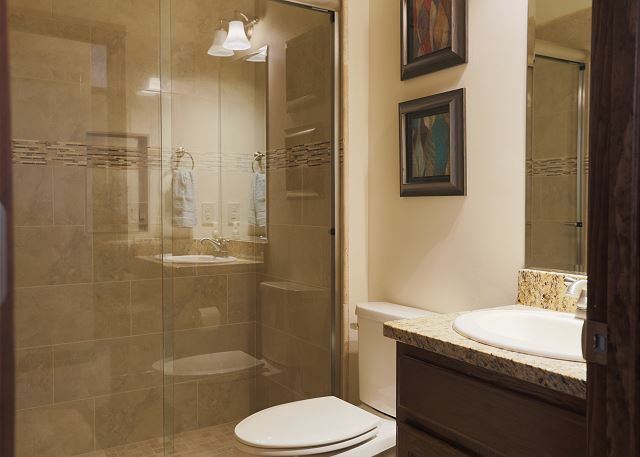 That person shared the master bath. Kitchen has most of what we needed. Grill is a little electric job that will cook the basics. Very close to Buffalo Ridge golf course. 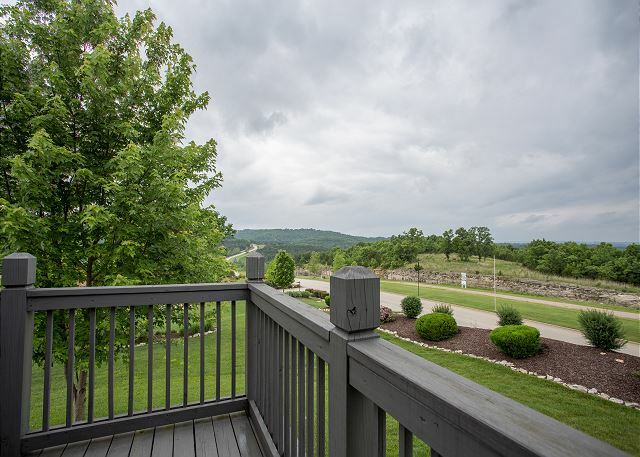 The Buffalo Ridge Retreat property is in a quiet neighborhood just outside of Branson. The house is in great condition and provides most of the amenities we needed during our vacation. This was the second time to rent this particular house. The owners made improvements between our visits (about 1.5 years apart) by adding onto the deck and enclosing a study. This is a great property. The place was great. I only had 2 complaints. The house didn't have internet and the Directv channels were very limited. Had a great time there. 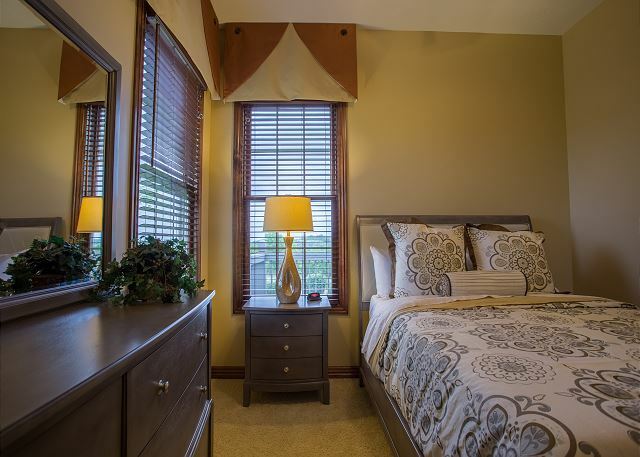 If you're looking for a luxury stay at Branson this is it. Clean beautiful home. Close to the strip but far enough to relax. Wow what a wonderful house and area close enough to everything but so peaceful. Good morning, Joe! We're so happy to see that you liked staying at Buffalo Ridge Retreat. We can't wait to see you again, and remember to mention your previous stay with us for a returning guest discount! Great house. Quiet and clean. 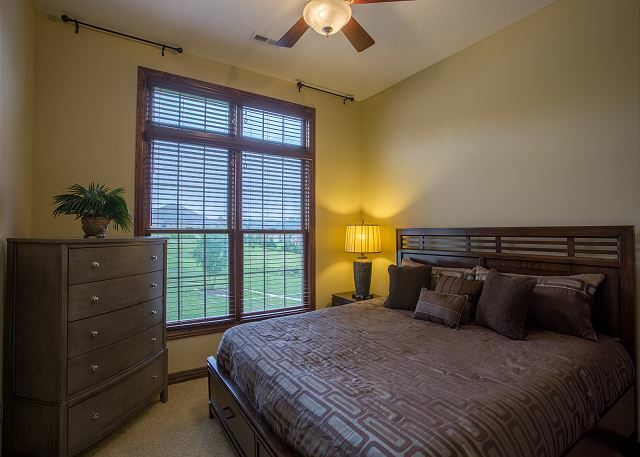 Great master suite, bedrooms, kitchen, living room, and deck area. Plenty of room in the garage as well. Missing wifi and a good grill. Excellent property and location. Staff at Sunset best I have dealt with. Great folks! House is lovely. Worked great for 3 couples. Could definitely use some serving spoons, wine glasses, and a few more kitchen items. Unfortunately there is a new golf course under construction nearby, and large semi trucks filled with rocks and dirt are going back and forth on the road behind the house all day long. Very noisy if using the screened porch. However, would definitely rent again. Hi, Barbara! We're so glad to hear that you enjoyed Buffalo Ridge Retreat, even with the noisy work going on. We hope to see you again in the future, and whenever you decide to come back just mention your previous stay and we'll happily give you a returning guest discount! The house was very nice but didn't like the traffic on the road behind it. Also, wish there had been more kitchen supplies and toiletries. Couldn't find any garbage bags either. Overall, it was a pleasant time. Almost everything about this property is as advertised. Very clean with great features. 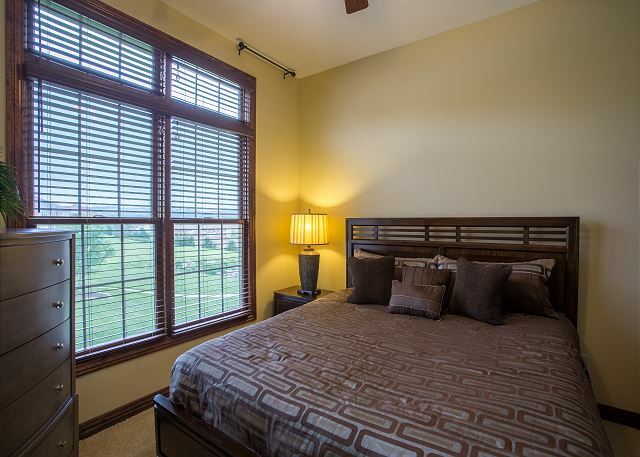 Location is very close to attractions but far enough away from strip to feel more relaxing. Only complaint would be that, if you are a sports fan, you are out of luck as the tv programing does not include sports channels. This should be a given. Our family had a wonderful time at the Buffalo Ridge Retreat. We were able to cook our Thanksgiving meal at this very clean and beautifully decorated house. The kitchen was well equipped and we had enough room for our entire family. Great location! Close to Top of the Rock and Branson Landing. We will definitely stay here again. I will highly recommend to my friends and family. WOOOOW! What an incredible place! 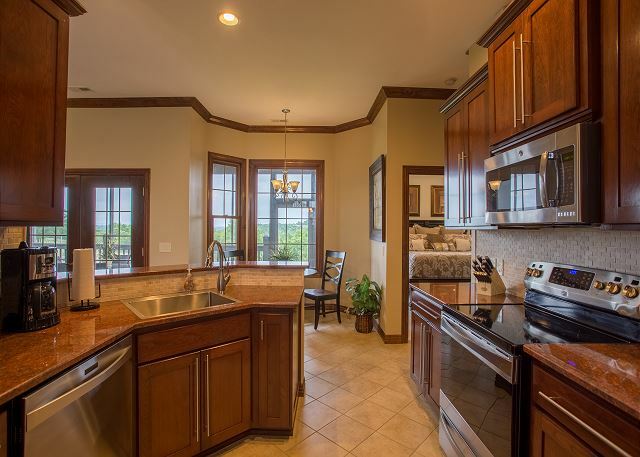 From the "mansion", to the cleanliness of it all, to the amenities, to the location, to the view...WOW! Our family would definitely recommend this gorgeous home, and we ourselves are excited to stay there again! Our trip was great. From the wonderful shows down to the accommodations. The house was perfect. Very close to the shows but far enough for peace and quiet. Very nice neighborhood to take a run in the mornings. Only thing I would suggest is for the cleaning crew to spend a little more on the kitchen garbage bags. Those things were so thin and did not fit the garbage can. What a mess. The house was great. Very clean and well stocked.Good location.The golf course down the street Buffalo Ridge is a great course and a must play. We will be back. Sunset Rental services are a great company to rent from. The location of this property is perfect. Its far away and close enough to all the main attractions of Branson. The house is very nicely furnished and seems very new. We will definitely consider it for our next trip. All in all, I would recommend Buffalo Ridge. 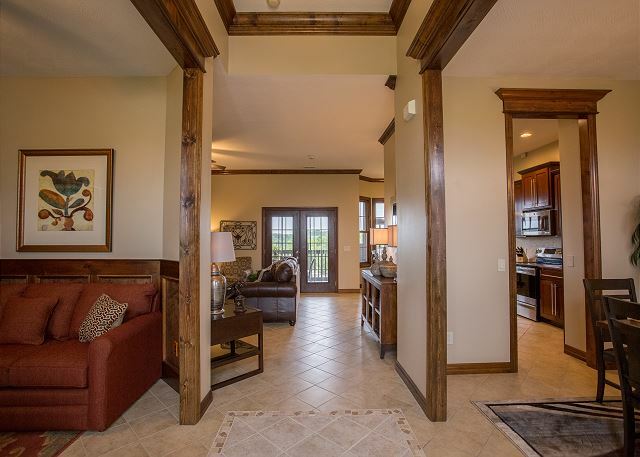 The location of this home was perfect if you want to be away from the crowds but within a 5 minute drive to activities. The home was clean and well decorated. My only minor complaints were that we were unable to enjoy the screened in porch due to the large trucks traveling on the road behind the home during the weekdays. Assuming there is some type of construction going on nearby but this is not something that the homeowners can help, nor is it a deal breaker for future stays. We also did not enjoy our visit to the pool as it was cloudy and had debris floating around in it. All in all, I would recommend Buffalo Ridge. It was a wonderful week! It was nice to come home to a home instead of just a hotel. Gorgeous view and perfect home! Loved the home from the moment we arrived! Just a few minutes from shopping and the Branson strip. We played golf down the street at the most amazing golf course ever played at Buffalo Ridge! Kids went swimming at the pool and had a blast all week. I could have asked for a better home and experience! Thanks for keeping the home immaculate and all the extras we needed to feel right at home. You can't go wrong renting this home... A steal of a price!